Last Updated: 11 Mar 2015. I went to Agra along with four of my friends. The Taj Mahal, popularly known as the Taj, is one of the seven wonders if the world. It is the symbol of the Mugal contribution to Indian art. In the early Mugal period, the Persian art forms had their own influence on Indian art styles. This is reflected to a great extent in the "Taj". Shah Jahan, the magnificent is often called the greatest builder among the Mugals. He constructed the Taj Mahal "a dream in marbel" in memory of his wife Mumtaz. The magnificent Taj stands on the banks of the river Yamuna. It outranks the buildings of Versailles, the Pyramids of Egypt in its loveliness and splendor. It is a building inspired by a man's love for a woman. The main building stands on a raise platform. It invites the wonder struck tourists to the white dome capped y a brass trident. It is an octagonal building with four sides. The arched gates with their latticed walls are a treat to watch, especially on a moonlit night. On crossing the huge red and white sandstone gate one can see a crowd of camera men. They oblige those who wish to have a snap with "Taj" in the background. A few steps down we come across green lawns and hedges. The tombs of Shah Jahan and Mumtaz lie in the big central hall. They have beautiful marbel work around them. The four corners of the Taj Mahal have minarets. The four corners of platform also have beautiful minarets made of marble. The dome of the central hall is painted in RANGOLI style. The beautiful Taj with the two stone paths flanked with fountain in a canal is really a great treat to the eye. Little wonder it is India's major tourist attraction. By Jitender Kumar / In Rewari haryana.. The Taj Mahal is one of seven wonders of the world. It was built by mughal empire shah jahan in memory of his wife Mumtaj on the bank of Yamuna river. It take time about 22years for completing the taj mahal. After completion of taj mahal shah jahan has cut the hands of the workers who made the taj mahal. Its brightness is on the peak when there is full moon day. It is pride for us that in the world seven's wonder one wonder is in our country. So, it became the tourism place. Many foreign tourists visited there. By Jitendra Singh Kirar / In Bairagarh Bhopal.. The Taj Mahal is on of the seven wonders of this world. It is because The Indian people voted for it and the Taj Mahal got more votes than the pyramids of Egypt. If we see the beauty of Taj by sky way I mean to say that by the help of helicopter, Its view looks very beautiful. It looks like a dream. The beauty of Yamuna behind the Taj looks so Oasum. Well my point of view the Taj Mahal is the wonderful thing in the whole world and It is appreciatable. We should visit there and praise it. Taj Mahal is one of the nine wonders of the world. It was built by shahjaha in the memory of his wife Mumtaz. It is built of white marbles and is on the banks of river yamuna. 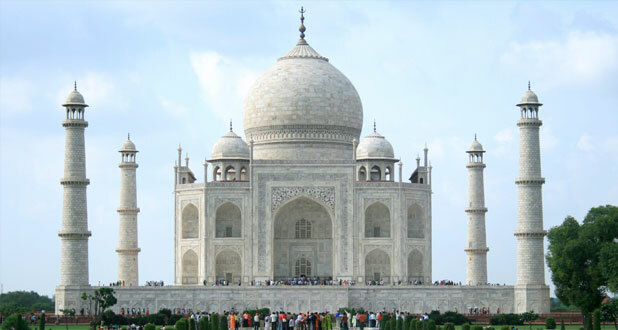 Built in Agra, is one of the famous tourist destination. It is visited by tourist from all over the world. It is known for its beauty and is a pride to our country. By Kamal / In Salem. Taj Mahal is one of the nine wonders of the world. It was built by the King Shajahan in memory of his beloved wife Mumtaj. It is built on the banks of the River Yamuna. Taj Mahal is built in marble. It is beautiful sight to see it on the full moon night. It is the pride of India. By Ibrahim / In Nakpur. the Emperor Shah Jahan in memory of his wife Mumtaz Mhal built the Taj Mahal. He was very proud of his monument and did not want it to be ever copied by anyone. It is a rumour that be chopped off the hands of the architect who designed it so that he would never be able to design another such monument. The beauty of the Taj has to be seen to be believed. It is built entirely of white marble. The building consists of a dome in the center with four minarets on each of the four sides. A marble pathway leads to the main building. On all sides there are luscious well-maintained lawns and tall trees at regular intervals. The Taj mahal is, of course a beautiful sight during the daytime, but it appears to be truly majestic in the moonlight especially when there is full moon. The Taj mahal is one of the greatest tourist attractions in India. In fact no trip to India would be complete without a visit to the Taj Mahal.